Welcome to the Admiral's Haven. The Admiral's Haven, named after the Admiral butterfly, provides a home and shelter to travels that are stopping in Vancouver. 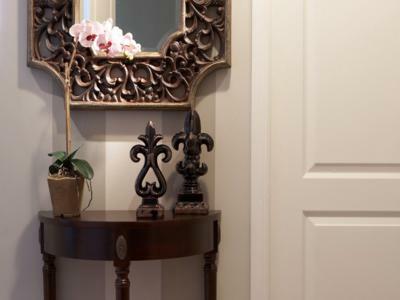 The property features decorative painting applications and faux finishes in each room, in a wide array of colors and designs. The three bedrooms, two bathroom townhouse is elegantly designed. The layout is unique with its two level floor plan. Bedrooms and bathrooms upstairs, living room, dining room, kitchen and laundry on the main levels. There is a patio, with an English style garden, patio set and lawn chair. The kitchen is fully functional and is equipped to entertain guests. It has a gas stove and oven, fringe, dish washer, microwave, toaster oven, and coffee maker, and comes complete with ample dishes, cook ware, utensils, etc. The family room has a small table that seats 4 guests for dinner nestled by the fireplace, with a madras faux finish on the walls featuring glassed yellow stripes. Adjacent to the family room, is located a patio area ideal for getting some sun, enjoying a BBQ in the summer, or having a glass of wine. The dining room, with the large chimney and vaulted ceiling is the great place to entertain, have evening drinks etc. 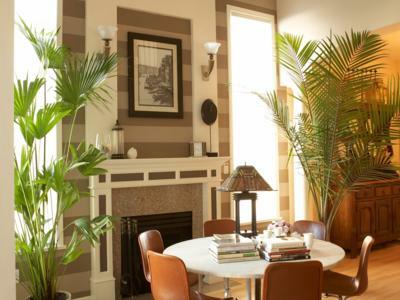 A feature wall made of two tones of brown stripes set an impressive backdrop for any table setting. 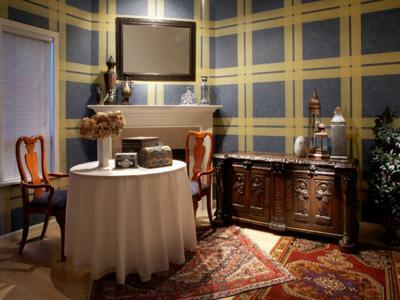 The room is decorated with tapestries from Europe, attention to design, and the finest interior decor. Choose from three unique designed bedrooms. Heading up the stairs to the 2nd floor, you find a mezzanine level overlooking the majestic dining area below. To the left are double doors leading to the master bedroom suite - the 'Captain's Room', complete with double bed, pull out sofa, desk, private TV with multi region DVD. The ensuite bathroom has a Jacuzzi tub, shower, double sink, and toilet, complete with towels. 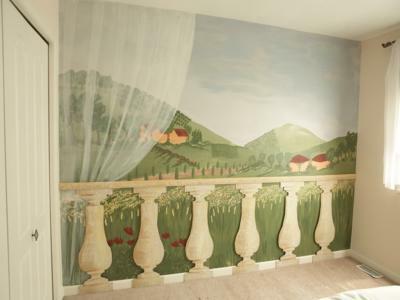 The 'Tuscan Balcony' room features a full size mural of the hills of Tuscany with a silhouette of pear shaped pillars common in Italian architecture. The queen size bed faces the mural so to give the impression that the there is an unobstructed view of the rolling hills. There is unique credenza in the room to store items, a table with two chairs, to enjoy a cup of tea and double sized closets with lots of storage. The Ponderosa in Paisley room is a well appointed bedroom, boasts a two toned beige and brown bed cover in paisley. The walls are painted distinct colors of chocolate brown, cream, and aqua blue. There is two pedestal desk, dresser, flat screen TV with DVD, and a closet. Lots of lighting to set the mood, with the time of day. The 2 bedrooms share one bathroom located in the hallway. There you have double sinks, a shower combo tub, and toilet complete with towels, and bathrobes. The Admiral's Haven is located only 8 minutes from the Vancouver airport by taxi or car. Only five blocks or a 10 min walk to the Aberdeen Canada Line station and easy access to downtown, 22 minutes away. The Oval is located only 5 by car or 15 minutes walking. It is easy to get to the 3 malls in the area, Richmond Center, Aberdeen Mall and Lansdowne Mall, with all the restaurants, shopping and entertainment that Richmond has to offer. A 30 minutes bike ride along the river and the west side of Richmond, give you direct access to Stevenson Village, known for its artisan shops, boutiques, and wine tasting, not to mention the harbor, fishing boats, and leisure lifestyle. Sofabed in living rooms sleeps additional 2 guests.